Back in 1993, when Artie and Robin were just two kids in a small upstate NY high school, Artie began experimenting with fermentation. His dandelion wine didn't win any awards, but he didn't have any trouble unloading it to his friends either. While attending culinary school Artie worked at Loon Ale Brewery in Manchester, NH, mainly because he couldn't resist all the free beer he could carry after his shift ended on the bottling line. After college Artie began home brewing beer, wine, and ciders. Robin was never much a fan of any of these and decided to start brewing her own ferments, first water kefir. After a few years battling over her open ferments cross contaminating his beers, Robin decided to try another probiotic ferment- kombucha. Finally, a ferment they could both agree on! Kombucha's tart and tangy taste captured their hearts and resolved Art's lifelong acid reflux issues. 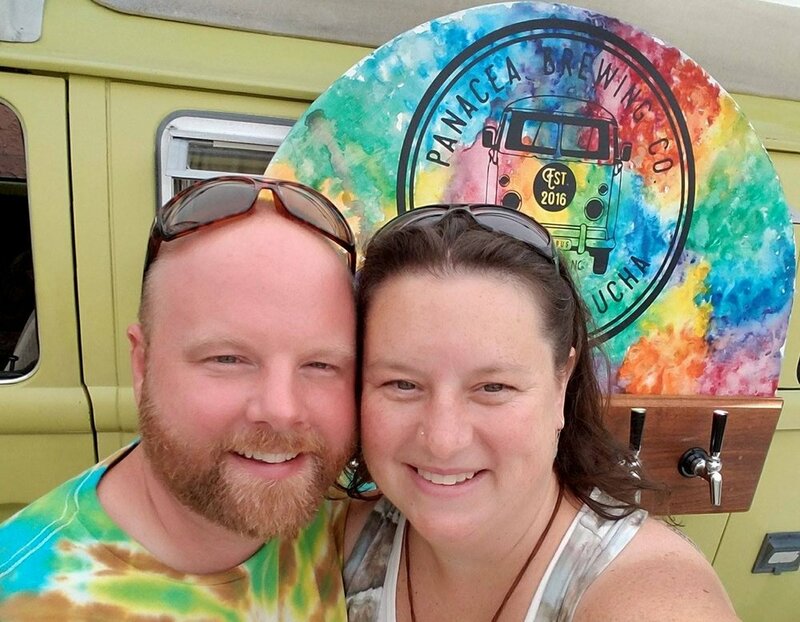 After getting rave reviews about their homebrew, the couple launched Panacea Brewing Company in 2016 from the Burgaw Incubator Kitchen. They started selling at farmers markets from a Artie's custom built tap system on the side of their 1975 Volkswagen Westfalia, now called the Boochbus. In 2017 Panacea Brewing Company moved into their new space located at 102 Old Eastwood Road Unit A5. Panacea Brewing Company continues to grow organically, taking bigger steps one batch of booch a time.